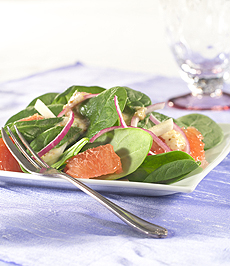 Spicy dressing and sweet grapefruit take this spinach salad to another level. Photo courtesy TexaSweet Citrus Marketing. This is Page 7 of a nine-page article. Click ton he black links below to view the other pages. The spicy dressing of this recipe takes a simple grapefruit and spinach salad to a higher level. For a luncheon salad, you can add grilled shrimp or scallops. Recipe yields 8 servings. For salad, mix spinach, jicama and onion. With a sharp knife, section grapefruit while working over a small bowl to catch the juice. Reserve juice for dressing. Cut the grapefruit segments and add to salad mixture. Toss and chill. For the dressing, combine all ingredients, except poppy seeds, in a blender and blend until creamy. Season with salt and coarse-ground black pepper. Drizzle dressing over salad mixture and toss. Arrange on salad plates and garnish with toasted poppy seeds.